Life gets busy, especially when you have children. When you are constantly ferrying your children between day care, play dates, and soccer practice, and trying to find ways to spend time with your spouse despite your opposing work schedules, it seems like there is always some issue to deal with, and that can make it easy to neglect certain routines. One that, unfortunately, falls by the wayside for many families is eating dinner together every night. This only gets more difficult as your kids get older and have more demands on their time. It might be tempting to cut down on family dinners, but regularly eating together as a family offers a multitude of benefits to your family in general and your children specifically. 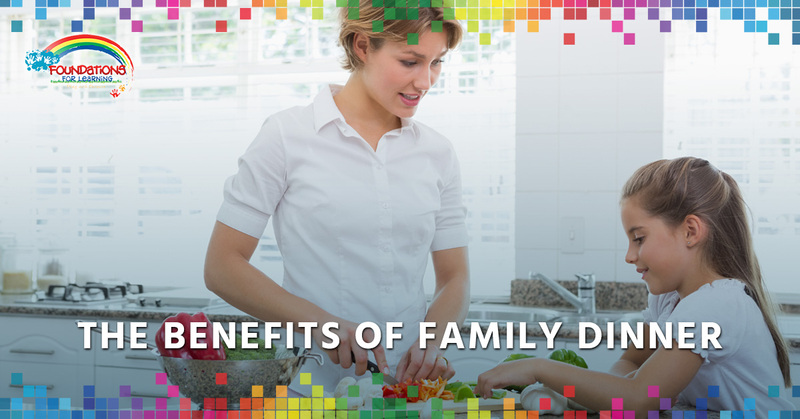 There are a lot of ways your family stands to benefit from frequent family meals. First, it unifies your family and gives you a common identity. This is a way to carry on your traditions as a family, like eating someone’s favorite dish on their birthday. This is also where you can teach your child about their culture through cuisine. This quality time you are spending with your family also enables you to teach your child your values in a natural way as you relax and share your days together. Not only does the whole family benefit from family dinners, your child specifically can benefit from them. Research shows that children who eat dinner with their families every night are less likely to abuse substances or skip school, perform better academically, and have a higher sense of well-being. This can be contributed to a number of ways family dinners help children. First, they give parents the opportunity to check in with their child every day. This kind of insight into the moods and activities of their children give these parents a better idea of what is going on with their kids. In addition, family dinners add structure to a child’s day. Routine is an integral part of creating a sense of security for kids. Eating together also gives your child an opportunity to develop their language and conversation skills, which, as we covered in a previous blog, is important for success. When you make family dinner a ritual, you all stand to benefit. Eating meals together offers the family an opportunity to bond. This is a built-in time every night when you give your time and attention to your loved ones. This enhances the communication you have between everyone in your family constellation, and allows you to deepen your connection by having fun together. However, it’s important to do family dinner the right way. First of all, you don’t want dinner to be a time that your kids dread, so don’t use it as a space to lecture them. Family dinner should be fun to maximize their benefits, so save those conversations for when you’re away from the table. In addition, this should be a sacred time you spend together without distractions, so no TV, computers, tablets, phones, or anything that will pull anyone’s attention away from the family. Focus on engaging everyone in conversation together. At Foundations for Learning, we want the best for your child. If you’re looking for a daycare in Glastonbury, contact us to schedule a tour!